Preheat oven to 425 degrees. Cook pasta per the directions on the back of the bag for 10 minutes in an oven safe pot. I used a 3 quart pan that is safe to use on the stove and in the oven. Drain and add back to the pan, add the pesto and mix thoroughly. Add in the tomatoes and cubed mozzarella and mix thoroughly so they are evenly distributed with the pasta. Last, add on the sliced mozzarella, place in oven uncovered for 20 minutes. Serve and enjoy! 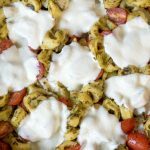 30 Minute One Pot Caprese Tortellini Bake Recipe found on https://thissillygirlskitchen.com/30-minute-one-pot-caprese-tortellini-bake/ *All nutritional information is approximate and may not be 100% accurate. Please consult a nutritionist for more specific information.